August 17, 2014 -- Dozens of Glenwood Landing residents turned out this past Tuesday night for a public hearing at North Hempstead Town Hall in Manhasset to express their opposition to an application to rezone a .38 acre parcel of land at the corner of Ram’s Hill and Scudders Lane. The property’s owner Vincent Cangiolosi was seeking a change in the site’s classification from industrial to Multiple Residence (R-M) in order to enable the construction of a three story structure with 8 condo units. After more than an hour and a half of testimony, the North Hempstead Town Board voted unanimously to deny the application. The public hearing opened with a presentation from a team representing Mr. Cangiolosi that included an attorney, an architect, an engineer, a traffic expert, and a representative of Laffey Fine Homes Real Estate. The three story structure, they said, would be 12,397 square feet, with a 4,159 square foot footprint, with three two-bedroom units each on the first and second floors and two three-bedroom units on the third floor, as well as basement parking for 16 cars, and two additional spots. Showing an image of a three story bright orange structure, the team contrasted their proposed structure with a worst case scenario of what could be built if the site remained industrial, and contended that, with the demolition of the Glenwood Landing power plant and the likely construction of the already approved Glen Harbor project at the sharp turn where Shore Road ends and Scudders Lane begins, the area is moving from industrial to multi-family residential, and that the proposed building was consistent with these changes. Additionally, they said that the traffic generated by eight condo-units would be significantly less than with an industrial site. Mark Laffey of Laffey Fine Homes Real Estate, said that the three story multi-family residential structure would have a positive impact on area property values, especially relative to the impact of industrial development there. With regard to property taxes, a representative of VHB engineering said that the 8 units would likely generate $91,550 in property taxes, with more than $67,500 going to the North Shore School District, and that based on a formula from a Rutgers University study, costs for two school age children could be expected to be incurred by the district, at $32,000 a piece. Additionally, the team said that there was plenty of room at the site for a septic system to accommodate 8 units. Several Glenwood residents, most from Ram’s Hill and the surrounding area, spoke in opposition to the proposal, focusing primarily on four issues – water usage, traffic safety concerns, the environmental impact of an on-site septic system, and the character of the neighborhood. Michael Nestor of Ram’s Hill made several arguments against the proposal, but emphasized the potential traffic safety issues. “This is on a blind curve,” he said. “It’s an inevitability that someone is going to get killed." Other residents made similar points. Subodh Modi of Ram’s Hill highlighted, among other issues, the demand for water a building with 8 condo units would put on the Glenwood Water District which has already imposed restrictions on usage this summer due to the loss of two wells in Roslyn. Doug Winkler, of Glen Head, a certified environmental planner, like others there spoke of the potential environmental impact on Hempstead Harbor. With the clay in the soil of that area, he said, waste water would naturally seep horizontally into the harbor. Before voting on the application, Town of North Hempstead Supervisor Judy Bosworth asked Department of Planning & Environmental Protection Commissioner Michael Levine to advise the Council on whether the rezoning application ought to be approved. Citing concerns about water usage and the environmental impact of a septic system for eight units, he recommended that the property not be rezoned multiple residence. 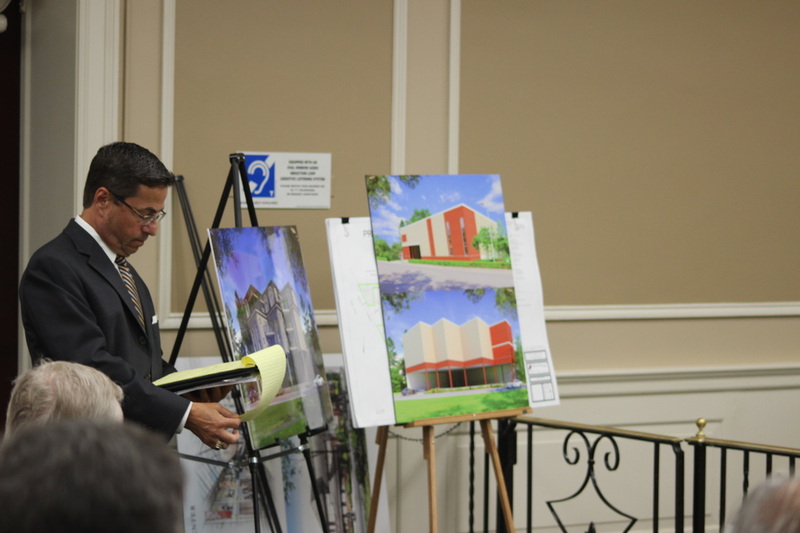 He added that the Nassau County Planning Commission was recommending disapproval of the application, and that they had recommended re-zoning the property single family residential.